One of many advantages of working in a multi-cultural office is that you learn about new recipes everyday. Sometimes you find yourself in a discussion about different versions of the same dish that people feel very strong about—convinced that their recipe is, of course, the best one. So let’s talk about potato salad today. There are countless questions and things to discuss, because all recipes seem to only have potatoes in common. But which potatoes are the right ones? Should you season the cooking water? To mayonnaise or not to mayonnaise? Eggs or no eggs? Which add-ins are the best—and are they even needed? We knew there was only one way to find out which recipe reigns supreme. After our search for the ”bestest“ banana bread recipe, it was time for another contest! So we gathered 5 “best potato salad recipes” from the office and whipped them up. Then we served it to our highly-qualified Kitchen Stories Eat Force and ranked them. The results are in—which is the best of the best? German potato salad is not a recipe—it’s a religion. Did you know that there is a mayonnaise border throughout the country, separating the North-German potato salad from the Southern one? Northern potato salad always features mayonnaise. This recipe is actually a Saxonian recipe from our Head of Community, Marie, and her family. It comes with pickles, eggs, and even sausage salad. Will it also win the rest of the team’s hearts? Find the recipe here. Whilst Germany is arguing about mayonnaise in potato salad, Americans discuss “egg or no egg?” Our American Editor-in-Chief, Julie, sent me an “All-American potato salad” recipe by Martha Stewart, who already won our banana bread contest. Besides mayonnaise and eggs, her recipe also features celery, bell pepper, and celery salt. Will she win again this time? Find her recipe here. Chinese potato salad might not be THE recipe everyone thinks of as emblematic of the cuisine. Still, our Head of Business Intelligence, Yijiao, found a recipe that we had to try. It looks like a hybrid of mashed potatoes and potato salad. So let’s find out if mashed potatoes with mayonnaise, sausage, peas, and corn will be able to change our idea of potato salad. Find the recipe here. If there is a Northern German recipe, there also has to be a Southern one, which comes from our Head of Content Operations, Clarissa, who even brought regional potatoes and onions for the event. This salad doesn’t hide behind a long list of ingredients, but concentrates on a few, key ingredients: potatoes, onion, and a vinaigrette. Will the “back to basics” concept win, or is more really more? Find a similar recipe here. On my search for the last candidate, I talked to our Graphic Designer, Bernadette, who told me about “Salade Piemontaise,” that she ate as a child. She didn’t even like it that much, but we wanted to try it out anyway. It’s quite a common potato salad with mayonnaise, but also features tomatoes, cream, and ham. Find the recipe here. 1. The “right” potatoes: Since most potato salads require to slice or dice potatoes, it makes cooking easier to use waxy potatoes, since they won’t fall apart easily after cooking. But as seen in Martha Stewart’s recipe, you can also use floury potatoes. Just make sure to keep a careful eye on them so as not to overcook. Otherwise, you’ll get a mashed Chinese potato salad—but now that you know this one, you can just pretend that that was your intention, anyway. 2. Whatever potato you use, always start cooking in cold water. This way potatoes and water warm up together and evenly. Peel and cut the potatoes after cooking them. Yes, it’s kind of annoying to peel and slice potatoes while they are still warm, but slicing them before cooking would probably end in potato chaos. If the slicing is overwhelming, simply dice the potatoes. Problem solved! 3. Mayonnaise or no mayonnaise is apparently a question of taste. Still there are some rules to keep in mind when it comes to the dressing. If you’re using a vinaigrette, add it while your potatoes are still warm. This way it soaks in and the potatoes become more flavorful. If you’re using a mayonnaise-based dressing, let your potatoes cool down before adding the dressing, otherwise it will get oily. And now it’s up to you! 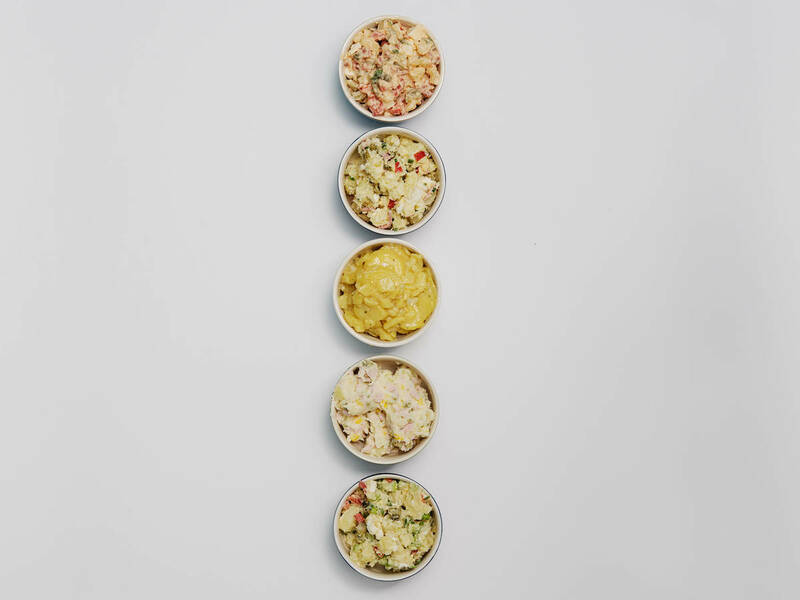 What’s your favorite potato salad recipe? Or do you have any more tips? Comment below, or send us your recipe at community@kitchenstories.com to be published on Kitchen Stories! Here’s our own best version of potato salad, test it out for yourself!